as recording, mixing, lighting, and DJ gear. Hundreds of new products are added monthly as the company continues to broaden and deepen its offerings. Cash Back is not available for orders that take place through a call center or store associate quote. Cash Back is not available on gift cards. 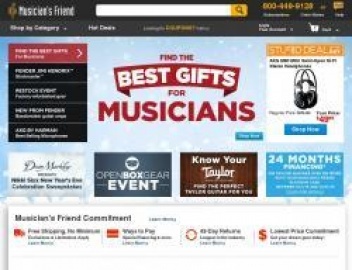 Click a Coupon or click Start Shopping to earn 4% Cash Back at Musicians Friend.